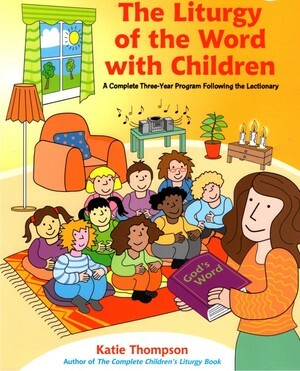 Liturgy of the Word for Children is offered during the 9:30 a.m. & 11:00 a.m. Sunday Masses. Before the Liturgy of the Word begins, the celebrant will call the catechist and children ages Pre-K to grade 2 forward for the presentation of the Children's Liturgy of the Word Lectionary and together they will proceed downstairs to the chapel - "our little church" for the presentation of the gospel on their level. After the homily - a parish greeter will go to the chapel to let the catechist know it is time to come back to the church to join the parish community. Celebrating the Liturgy of the Word with young people offers them an opportunity to meet their heavenly Father and to discover for themselves the riches that lie within the pages of Holy Scripture. Every Sunday, as we gather together to celebrate in Word and Eucharist, the mystery of our Lord's death and resurrection, we open ourselves to God's many gifts through prayer, praise and thanksgiving. When given a suitable opportunity, young people are more than capable of encountering God and developing a meaningful personal relationship with him. Even the very youngest child will enthusiastically enter into worship that is attractive, interesting, sincere and meaningful. Through appropriately adapted Scripture texts, prayer and activities, we can offer children the chance to experience a deeper understanding and participation in the liturgy.